Description A collection of black and white/sepia photographs of W.J. 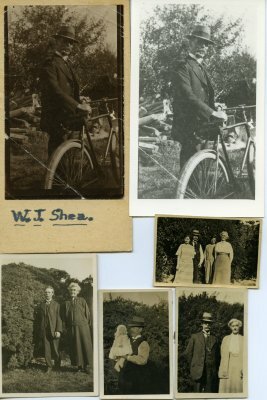 Shea (William John Shea), born in Wakefield, Nelson 1867 - died in Blenheim 1945. W.J. Shea was married to Fanny Shea (nee Broughan). 1. W.J. 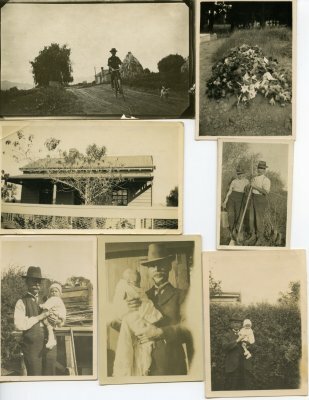 Shea holding his grandson, Gerard Gamble (x 3 photographs). 2. Uncle Will with Audrey. 3. W.J. Shea in garden with unknown young man. 4. Graveside for William John Shea, died Feb 1945. 5. W.J. Shea biking into Parkers flaxmill from Nelson Street, Blenheim. 9. Photograph of Fanny (Mary) Shea, W.J. Shea, Dorothy Shea and Fanny Shea Senior. Insrcibed on back of photograph: "Taken on a windy Sunday so don't look at our hair"